This has been an exciting week, and it’s only Tuesday! Yesterday the interview I did with Unsettling Wonder went online. I’ll be honest, I was a little bit nervous about it. The reason I love the written word is that I have time to think about what I’m trying to say, go back and amend things, polish it exactly right and then release it into the world after I’m satisfied. I’m so thankful that Rebecca not only gave me her questions in advance, but let me review the transcript and edit it. The day I have to do a purely video/audio interview is the day I’ll be a gibbering mess hiding in a corner, most likely. I’d been lately toying with the idea of releasing a short story I’d written in early 2013, The Adventurous Time Adventures of Doctor When. I have a very silly side, a part of me which seeks to be witty and hilarious, so sometimes my writing goes in that direction. I couldn’t entirely keep that part of myself hidden while writing Bestial, and there are scenes in that novel which I honestly cracked myself up while writing them. TATAoDW was a constant delight to compose, and I got to channel my inner ridiculousness throughout. 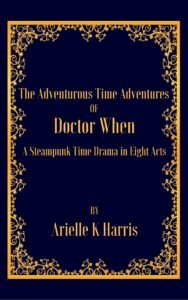 So as a way to encourage, and then celebrate, reaching over 100 likes on my Facebook author page, I published The Adventurous Time Adventures of Doctor When for free on Smashwords. I had intended to release via Kindle Direct publishing again, but they don’t give you an option to make your works permanently free when publishing with them. Instead I found advice online which suggested to publish for free on another platform, then in a week contact KDP that the title is available for free and they would have to price match as a result! Unfortunately this means that Kindle has my short story for $.99 at the moment, which I personally don’t believe its mere 6,000 word jaunt will give readers a feeling of value for money. Oh well. Some writers don’t believe in offering any of their work fo.r free, believing it will devalue their work in the eyes of readers, but I have a more positive opinion on the effect a short freebie offering may have on gaining readership, and encouraging readers to take a chance on a longer, paid title.